A WALL that will NOT work! I am writing this open letter to you, my fellow citizens of West Virginia, and any other American who cares about the direction of our government. Our President wants to build a wall between the border of Mexico and the United States to stop illegal immigration. First and foremost, I agree with him – we must stop illegal immigration. However, building a wall is not the answer. A year ago, I researched this topic and then published an article with my findings on my website michaelslambiotte.com. For your convenience, I have republished the article below. Unlike many critics of the wall, I offer practical and political alternatives that would work. I have never been one to present problems without offering solutions. I do hope you will take the time to read this article. Why Mr. Trump’s Wall Will NEVER Work! Let us look at some historical walls: The Great Wall of China, although not a continuous wall: Built 2,300 years ago and extends slightly over 5,500 miles. It was built to protect the Chinese states against raids and invasions by various nomadic groups from Eurasia. Although moderately successful, it was continuously breached by 'barbarians' from the West. They went over, around, and through the wall. Many of the so-called successes of the wall were because of the superior numbers and ferocity of the Chinese forces... in the beginning. However, over time, the wall and the Chinese forces were unable to prevent the westward migration from Eurasia. It failed to accomplish its goal. One argument I found interesting was that many historians found the wall was "nothing more than an ambitious project contrived by a vainglorious emperor." Interesting statement. A second failed wall - The Berlin Wall. It was built in 1961 and finally fell in 1989. 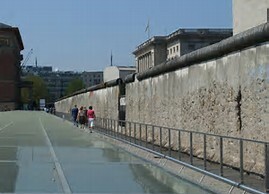 Its purpose was to keep East Germans from crossing into the free (West) section of Berlin. During the wall's 28-year history 'reportedly' close to 5,000 people attempted to escape from the East to West. Many died trying, reportedly 136 with the figure as high as 200. Many were shot by the East German border guards. Despite the dangers, people went under (tunnels), over, and through the wall (running check points). Some swam rivers. A few, leaping from apartment windows. Once, in a hot air balloon. Occasionally, through sewers. And, one man attempted to escape using a 'zip-line.' Point: No matter how high. How guarded, Regardless of life-risk. People went under, over, though, and around the Berlin Wall - using limited resources. People were willing to sacrifice their lives to seek a better life. It did not keep people from escaping. It just made it dangerous. There are many other examples of failed walls: Britain's Hadrian Wall in the 2nd century A.D., Spain's Ceuta and Melilla walls, the wall between Zimbabwe and South Africa, the Belfast Peace Walls in Northern Ireland...and many more. They all failed - eventually. Now, I want to briefly explain another reason why Mr. Trump's wall should not be built: Too expensive and a waste of resources. Spanning 2,000 miles, the initial cost was $12-15 billion. Current estimates put the wall closer to, if not above, $22 billion. Where will the money come from? Mexico is not going to pay for the wall. And, sanctions against Mexico would immediately hurt the U.S. economy. Our financial ties are too deep. That leaves the U. S. taxpayers. $22 billion for a wall that will fail. Building it would be a complete folly and would further jeopardize our increasing national debt. Job training (not wall jobs) and job re-training, education, healthcare, infrastructure, and transportation upgrades would be much better choices - for $22 billion. I am convinced Congress, with clear minds, would never allocate $22 billion for something that was simply a rally point for many and polarizing for others. Even if the wall did prevent illegal immigration, it would cripple, as we know it today, the U. S. agricultural industry. Most (to almost all) American citizens would not toil in our agricultural fields the way Mexican, Central and South American immigrants now toil. The work is too hard and the pay too little. But they (immigrants) are happy to have a job. At least most are. One possible solution, other than a wall: Work with the Mexican government to improve their economy. Immigrants come, legally and illegally, to the U.S. for a better life. If life was good (or improving) at home, they would not sell everything they own and risk their lives crossing dangerous unforgiving deserts. Another wall alternative: Alter, not repeal, the Posse Comitatus Act, a federal law signed in 1878 which limits the powers of the federal government in using federal military personnel to enforce domestic policies within the United States. Simply stated, this federal law prohibits the military from enforcing civilian law. My proposal is to alter this law, to allow the military to enforce border laws between Mexico and the United States, specifically targeting illegal immigration and drug smuggling. By changing/amending the law, the military would be able to use their vast surveillance resources against illegal drug and immigrant smugglers. Also, this enforcement would provide 'relatively' low-risk training opportunities, simulating larger combat requirements. Much of the U.S.- Mexico border is remote desert. Of course, the success of this operation would depend upon the full cooperation and coordination among the U.S. Military forces, state and local authorities, and private land owners. The military would lead, supported by Border Agents, state and local law enforcement. One key: respect the property rights of landowners. And the landowners must realize the military must act, with or without permission. Very touchy issues, but it could work. Done right, it would be effective and certainly would not cost $22 billion. We already have the resources. They just need reallocation and proper execution. Finally, even if Trump's Wall was built, it WOULD fail and we would lose $22 billion. Remember this: Unlike the examples I gave earlier, the drug cartels and smugglers have unlimited resources. They will find a way to go under, though, around or over any potential wall - as long as breaching is profitable. There you have it. My two-fold plan: Better cooperation and allocation of resources with the Mexican government and changing the Posse Comitatus Act. I do not have all the answers. But I do care, study, and research... before I speak (usually). Senator Manchin, Senator Capito, Representaive McKinley: Do with this as you see fit. However, I think we would all agree we must use the lessons from history, apply economic 'sensibility,' and find a way to bridge the center aisle to move our country forward. It was great discovering your website the other day. Some truly quality blog posts οn this web site, stored tο my bookmarks.